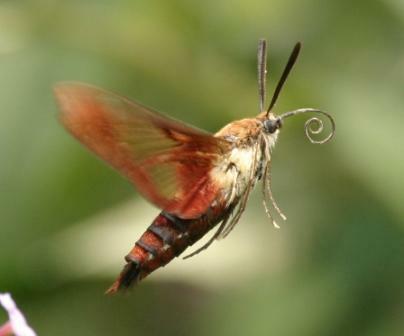 Description Beautiful moths that look like hummingbirds.Wingspan 1 1/2-2" (38-50 mm). Wings initially plum-red to brownish black, but scales drop off after 1st flight, leaving clear areas devoid of scales, except along veins. Body spindle-shaped, mostly olive-green with plum-red bands across abdomen and rear tufts. Caterpillar is yellowish green with darker green lines and reddish-brown spots on abdomen and with yellow tail horn. Life Cycle Caterpillar feeds on foliage of plants of the honeysuckle family. Habitat Forest edges, meadows, and cultivated flower gardens. Range Coast to coast in the North; also east of the Great Plains south to the Gulf. Discussion This moth hovers over flowers in full sunlight, producing a buzz with its wings similar to but softer than that of a hummingbird similarly engaged. There are 2 generations a year. Life History Adults fly during the day, and hover at flowers to sip nectar. Caterpillars pupate in cocoons spun at the soil surface. Flight. Two broods in the south from March-June and August-October, one brood in the north from April-August. Wing Span 1 9/16 - 2 3/16 inches (4 - 5.5 cm). Caterpillar hosts: Honeysuckle (Lonicera), snowberry (Symphoricarpos), hawthorns (Crataegus), cherries and plums (Prunus), and European cranberry bush (Viburnum opulus). 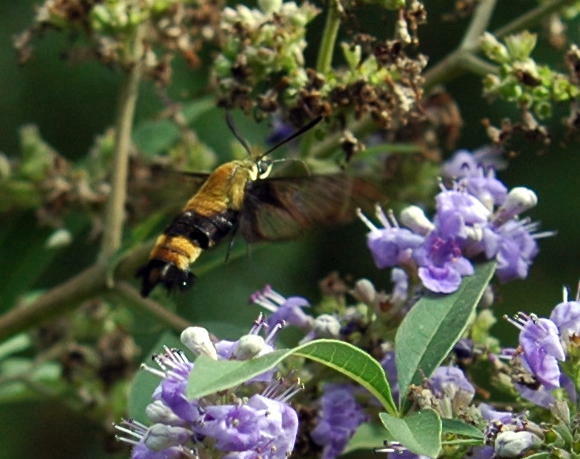 Adult food: Nectar from a wide variety of flowers including Japanese honeysuckle, beebalm, red clover, lilac, phlox, snowberry, cranberry, blueberry, vetch, and thistles. Habitat: Open and second-growth habitats, gardens, and suburbs. Range: Alaska and the Northwest Territories south through British Columbia to Oregon; east through the Great Plains and the Great Lakes area to Maine and Newfoundland; south to Florida and Texas. Here's an excellent site for more information on this wonderful insect.